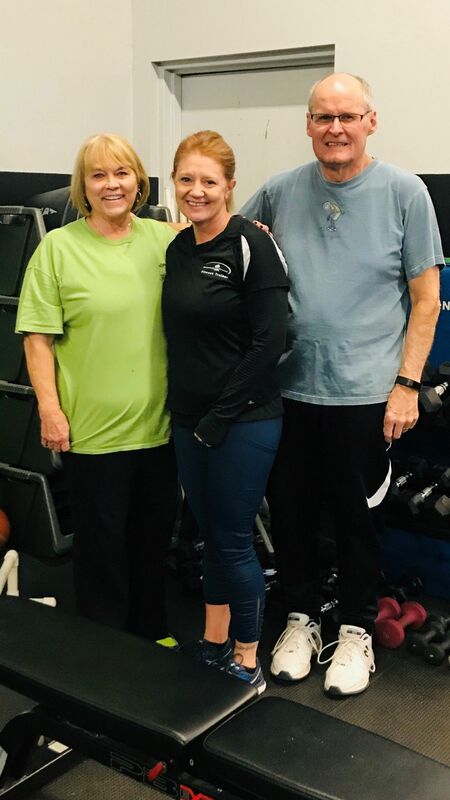 This sweet couple have been Crossroads Fitness members since the early 1980s. They joined a Small Group Training class with personal trainer, Tina, with goals of getting stronger and to have better balance. 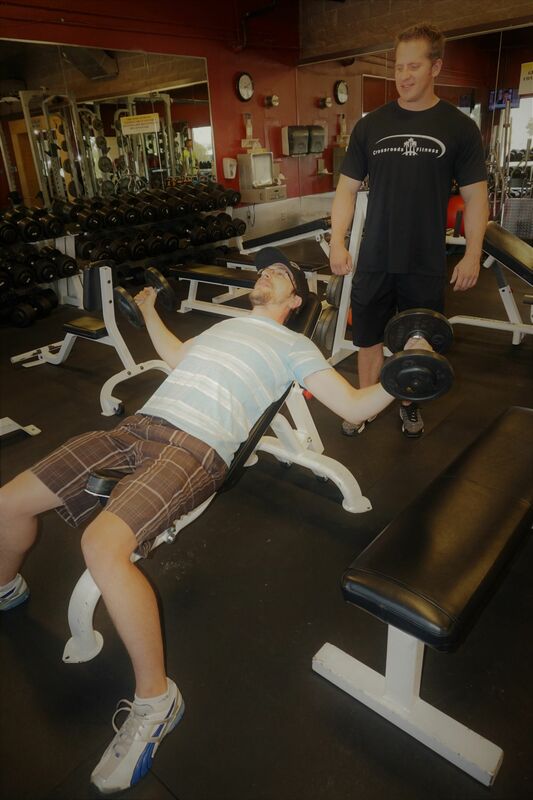 Jim says that he enjoys the group training atmosphere because it is fun and motivating. He is able to walk his dog 6-8 miles per day now and his balance is better than it has been in years. Deb says she has noticed a huge increase in her upper body strength. She says that every day tasks like washing dishes and unloading the dishwasher is much easier now than it used to be and she contributes all of that to her training with Tina. Together they have some knee troubles and shoulder injuries that they have to modifify exercises for and Tina is wonderful at giving them exercises to do to accomodate those issues safely. This Mother/ Daughter duo is a ray of shining light here at Crossroads Fitness. 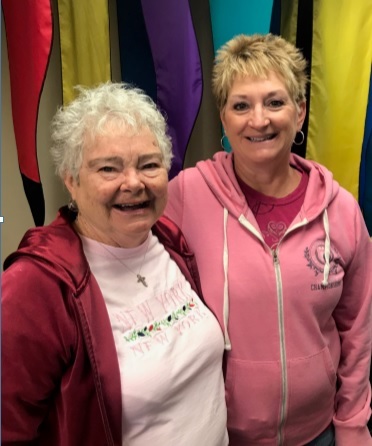 Melissa and Susie have been coming to Crossroads since February of 2018 and have found that this is their happy place! They enjoy going to the Sweat-n-Sculpt classes on Tuesdays and Thursdays. 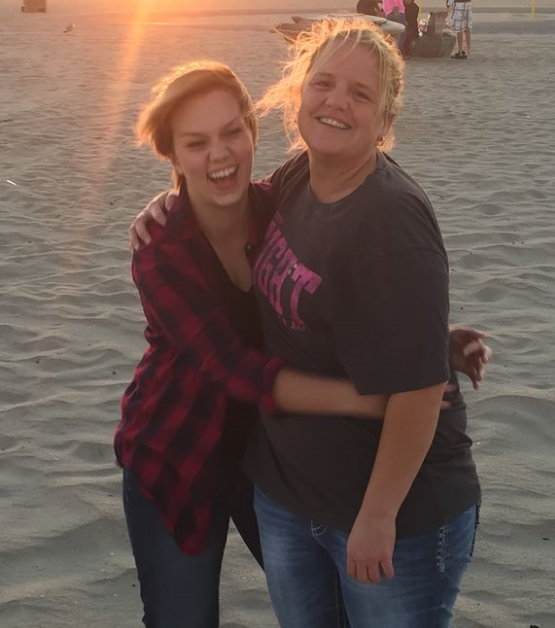 Melissa has found a passion for exercise she never knew she had and being able to share that with her mother she says is a true blessing. 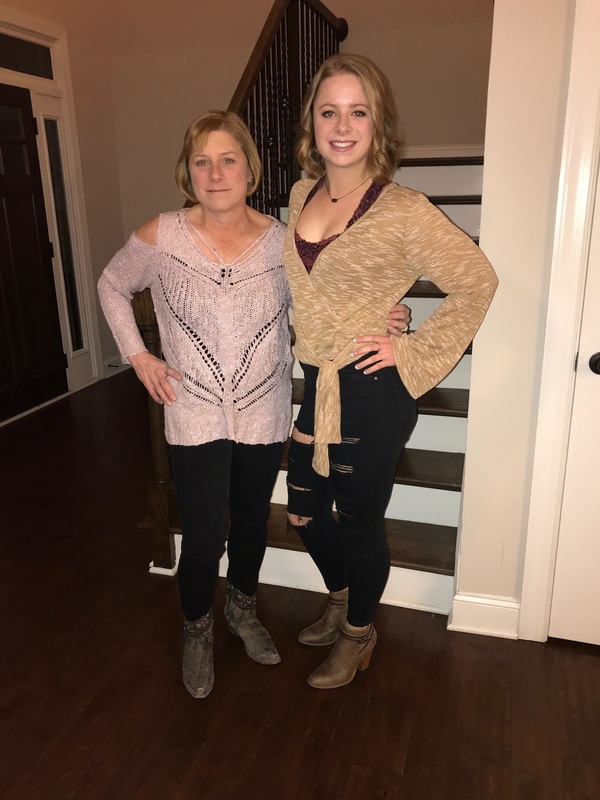 Her mom, Susie, has two knee replacements that she needs to be cautious of, so at first she was nervous and felt a little intimidated about taking a group fitness class. Pattie, the Group X coordinator, made her feel so much more comfortable and excited to take the class because she was so welcoming and helpful about what to expect and how to modify the movements to meet her fitness level. 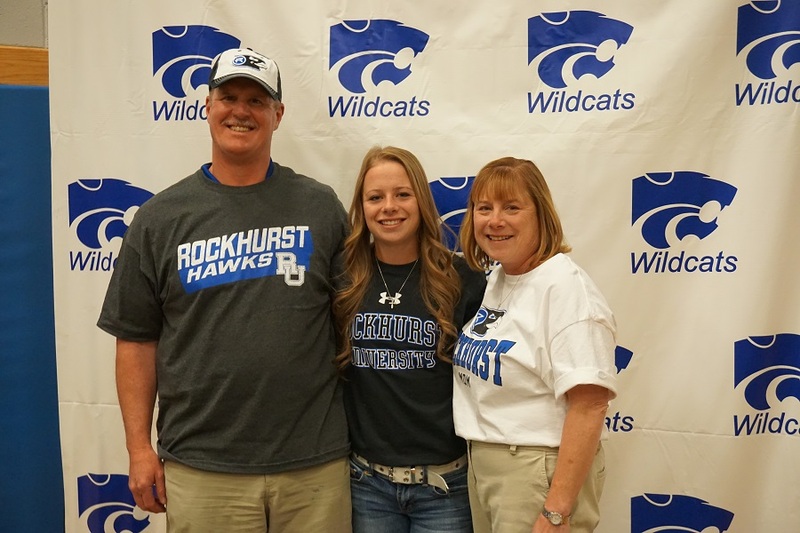 Seeing a few familiar faces that she knew from Rocky Mountain Health Plans was also comforting and eased her nerves that first day. They have been coming consistently to these classes since July and have tried a few new ones like Water Aerobics and Spin. 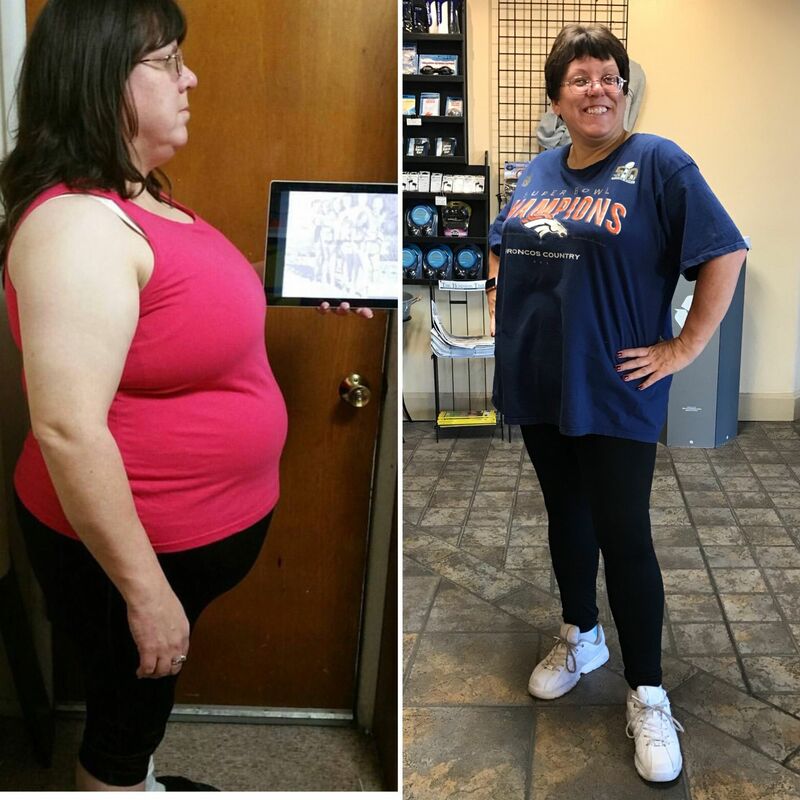 Susie was excited to share that she lost six pounds in the first two weeks of coming to the classes at Crossroads and Melissa is determined to get her body healthy and fit. They are a loveable duo that spreads happiness and makes all of us here at Crossroads smile from their true joy! I have been a member of Crossroads Fitness for over thirteen years. I really enjoy taking classes like Pilates and Chisel and have met some wonderful, supportive friends through these classes. I always feel like the staff at Crossroads is so encouraging and they really understand my situation. In July of 2014 I was diagnosed with Stage 4 Breast Cancer. This means that the cancer had already spread through my bloodstream and to my bones and liver. It also meant that I would never go into remission per my oncologist. 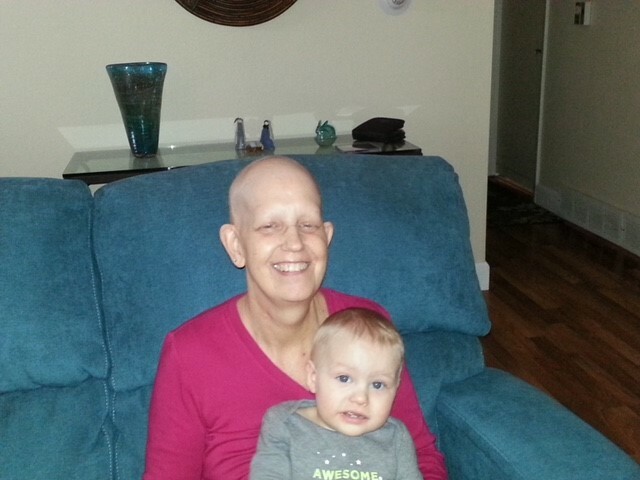 I then spent 3 months in chemo, 6 weeks having radiation and underwent several surgeries. Today, I am still on an oral chemo treatment. I was shocked to find out I had cancer. I continued to work at my job for two years after my diagnosis. I attribute being able to work to being in such great physical health from being a member of Crossroads Fitness for so long. Even during chemo and radiation I found what little bit of strength I did have to still make time to get some exercise in, even if it was just using the recumbent bikes. I am a fighter and I will beat this. I believe that because of my faith and because I have such a great support system! My health and fitness journey started March 8th, 2018. I was tired of being the skinny guy and shopping in the “boys” section at stores. My whole life I have always been super thin and never had any self confidence when it came to my appearance. Even when I was in the Army from 2004-2008 I was never able to put muscle on. 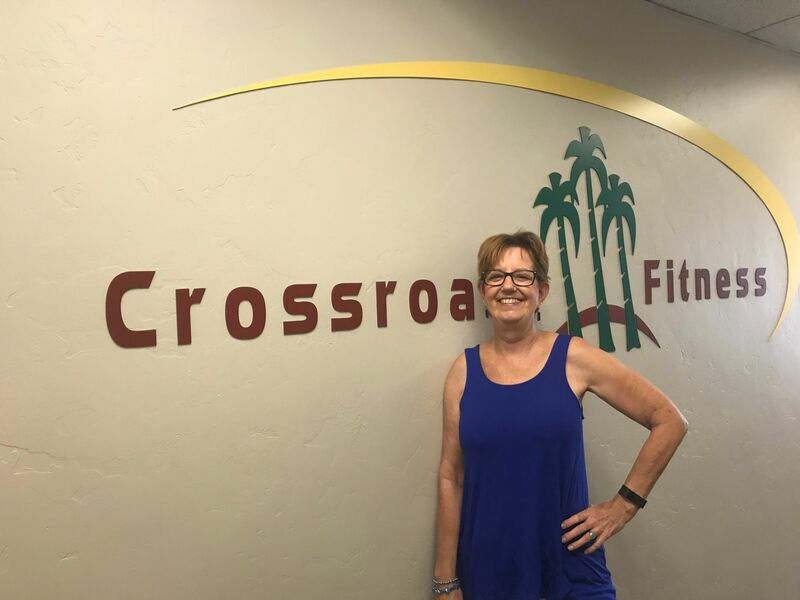 When I decided to get healthy and change my life, I chose Crossroads Fitness as my “gym” because it seemed like the atmosphere here at Crossroads was very laid back and not intimidating. Davin ,from the front desk sales team ,matched me up with my trainer, John Brewer, and I was immediately inspired and excited by how welcoming and encouraging everyone was to me. My very first training session with John was brutal! In fact, the first 30 days were incredibly hard, but John told me that if I stuck with it and didn’t give up, that he would help get me the results I’ve always wanted. The first major change I had to make was my nutrition. I went from literally eating 900 calories in a day to about 6,000 calories per day. John has me on a weight lifting routine that requires me to train with him 4 days a week and one day on my own. So far in the 5 months I have been working out at Crossroads , I have put on 40 lbs! 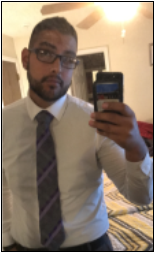 Not only has this physical transformation been incredible for my confidence, but my co-workers and friends have seen me transform into a better person. People tell me that I even stand up straighter and that I am a much more approachable guy now a days! I have even had a few friends and co-workers sign up for the gym now because they see how important it is to me now and they are inspired by my changes. Every week I am breaking my own records in the weight room, and improving on my lifts. John says I’m moving into the “big boy” weights. When I first started this journey I never thought it would be possible for me to do the things I am doing now. I’m happy to say that I now can shop in the “men’s” department for my shirts and I really look forward to continue this health and fitness journey at Crossroads and with John! Before Crossroads Fitness I had always struggled with my weight and self-confidence. For many years I would eat when I was sad or happy and every occasion focused around food. I developed a serious food addiction. Add that addiction to a sedentary lifestyle and I ended up depressed and very down on myself. That’s when I decided to join Crossroads! Getting started was tough, but with the help and encouragement from the staff and instructors I began to see results. I consistently took the group fitness classes Crossroads offers. The amazing people I have met though the classes have become a huge part of my life! Now I take HITTS, Insanity, P90X and Kick It on a regular basis. I love the high energy of everyone in the classes. We motivate and encourage each other. As much as I have loved seeing the physical results, I also realized that I needed to truly love myself again. I receive so much support and love from my “gym family” here at Crossroads who know the real me and continue to build me up daily! The instructors and members have become part of my success and without them I wouldn’t be where I am today.I have lost over 50 lbs, but have gained so much self confidence! I am excited to continue on the journey of being physically healthy and want to thank Crossroads Fitness for all the loving support and encouragement they have all shown me! I have been in Crossroads Fitness small group training with Amber for a over a year. During this period, I have dropped over 40 pounds and trimmed my body fat considerably. Friends that haven’t seen me in a while will ask me what I have been doing due to the physical changes I’ve made and I always credit it to the training with Amber three times a week! I can honestly say that I’m in the best shape of my life and not only look better, but feel much better as well. I finally have a bounce back in my step at 66 years old! I had several motivating factors to commit to this journey. I had knee surgery and wanted to recover as quickly and thoroughly as I could. The Doctor’s pre-op vital statistics labelled me as “obese” since my BMI was in that range. That statement really impacted me as that was not the person I wanted to be! Crossroads has a program to rent exercise equipment for home use, so I rented a bicycle to rehab the knee until I was ready for the small group training. Once I was ready for the small group training, Crossroads staff fitted me with a trainer that they recommended as the best fit. That is when I met Amber! She is a very motivational and inspirational trainer. Not only does she push us, but if something hurts due to pre-existing issues she always has alternative exercises to utilize the same muscle group. Having a sedentary desk job as a CPA, I never realized the impact from the easy life but negativ impacts from this lack of activity. I fully plan to continue Crossroads small group training as I consider it a very worthwhile investment in myself! I can now hike for 6-7 hours, mountain bike and downhill ski without wimping out! Three years ago, when my youngest left for college and I turned 50 years old, my husband and two children gave me a membership to Crossroads and 3 training sessions with Carla Bamford. I had been complaining about working out in our home gym because I was totally bored. I was really unsure of even how to work out because I had never really grown up in a gym setting. I had spent 20 years raising my children and expanding my career as a nurse practitioner and now all of my "Mom" activities were non-existent. 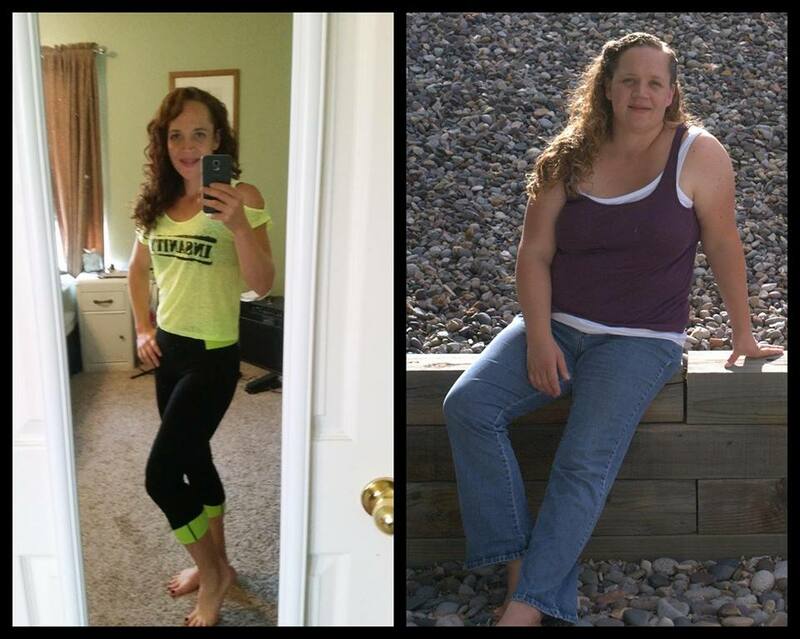 Within months of joining Crossroads I noticed a big increase in energy and a big decrease in my waist. I enlisted my friend, Nancy Benton, to join me in a Small Group Training session and we have motivated each other above and beyond. I lost 30 lbs and dropped from a size 10 to a size 4! I look forward to each work out with Carla and even my staff at work know to get me out on time now so I can get to the gym! Carla has taught me so well that I can even hit the gym at Crossroads and accomplish workouts on MY OWN! I look forward to continuing my training sessions with Nancy and Carla.! My name is Zachary Rosales. I grew up playing sports and I was an all state wrestler at Central High School in Grand Junction. 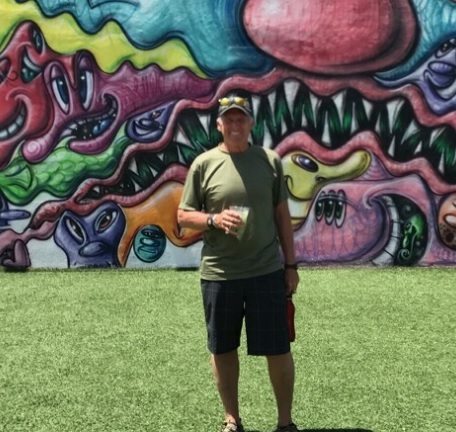 I got into fitness after high school and unfortunately when I was 24 years old a virus latched onto my heart and gave me congestive heart failure (CHF). This caused me to put on over 100 pounds due to fluid build up . The fact that I couldn’t breathe or do physical activities got my weight up to 311 pounds. 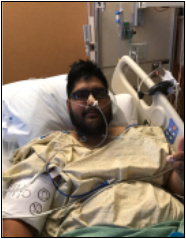 I’ve had multiple surgeries, stayed months in the ICU and been placed on a heart transplant list. I’ve gone to cardio rehab and have kept pushing and even though I still have CHF I have gotten down to 200 pounds. After I finished cardio rehab, Crossroads Fitness had all of the same equipment as my rehab , so I was able to show up 5 days a week starting off by doing what I could until I was cleared to lift again. Even though cardio is a hard task for me, I’m able to use the pool for that part of my workouts. My advice for others is even though it’s a slow process and the results may not come as fast as you want them, just show up one day at a time! Do what you can because before you know it you’ll surpass the goals you set for yourself! Hi! My Name is Rachel Saunders and I am one of the fitness instructors here at Crossroads. I can’t even tell you how momentous it is to be able to say that one line! I never would have guessed this would be where my life's path would lead but I am loving every second of it! You see my struggle with weight and debilitating shyness has been a lifelong battle. I had never been thin and I had horrid social anxiety. At the point in my life when we moved to Grand Junction I had achieved one big goal in my life. To become a mother. But achieving that goal was much harder than expected. I suffered some devastating losses. I was diagnosed with an incompetent cervix. When I became pregnant with my son William I was placed on weekly shots. I had to have surgery at 14 weeks and was placed on bed rest for the remainder of the pregnancy there after. Over 6 months of bed rest had taken a hefty toll on my already sorely out of shape body. I don't actually know what my end weight was. After the scale tipped 200lbs I simply stopped getting on a scale. 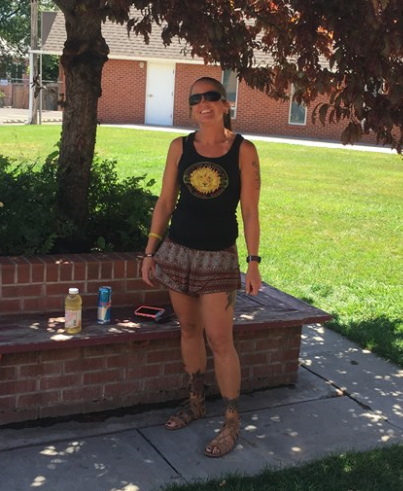 When we first arrived in Grand Junction I had not weighed myself on over a year. My son was now 3 and I had neglected my health for far too long! I was at my heaviest I had ever been and I was facing isolation. My husband had gotten a job in the oil field, which I knew meant my being alone half of the year. 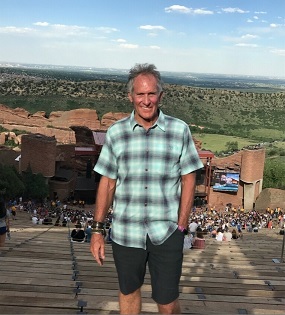 With every friend or family member I had ever know over 5 hours away in Salt Lake City Utah I set my mind to do two things. 1: walk every day and regain some resemblance of health 2: break out of my shell and make some friends. So, I did. I started walking my dog every day. The walking lead to a tiny bit of weight loss which fueled a fire. I joined a moms group and found some amazing friends one who encouraged me to join a gym. The selling point back then was an hour of me time, without having to worry about my son, just for an hour. So, I tried it. I did the only thing I thought I could maybe do at a gym, dance class. I had always loved dance, so I started with Zumba classes here at crossroads. The Zumba lead to a little more weight loss which fueled more fire. Before I knew it I was reading every fitness article and website I could find. I was researching and analyzing every bit of data available, as has always been my nature but I was now doing so in a feverishness pace! I found some websites to help me with my nutrition and found the best mix of cardio and strength for me. The best thing I found though was a lot of hidden confidence! I was coming out of my shell little bit by little bit. I was making friends and I was being encouraged by some of the most amazing instructors! Friends and instructors alike were putting a bug in my ear that I had a knack for this fitness thing. that I had natural athletic ability (who knew) and I should teach. I managed to lose 80lbs but what I gained was my life! The only thing left to do was to show others how to do it too. With the help of my friends and my amazing gym family here at Crossroads I can now very proudly say I am a healthy fit and even outgoing when the time calls for it ;-) fitness instructor, soon to be personal trainer. I can’t imagine where my life would be had I not come to crossroads and I don't want to even try. From a member . 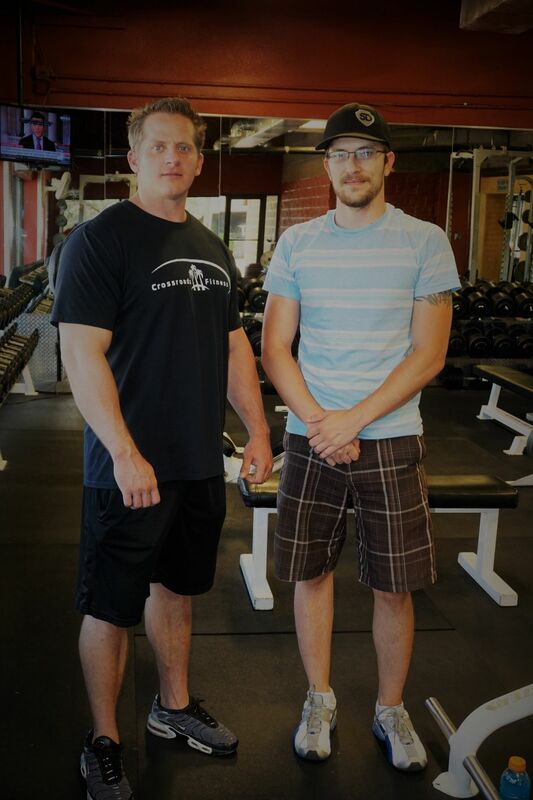 . .
As a long -time member of Crossroads Fitness Center, my family and I have always enjoyed your wonderful facility. The 2011 – 2012 year has given us an even greater appreciation. 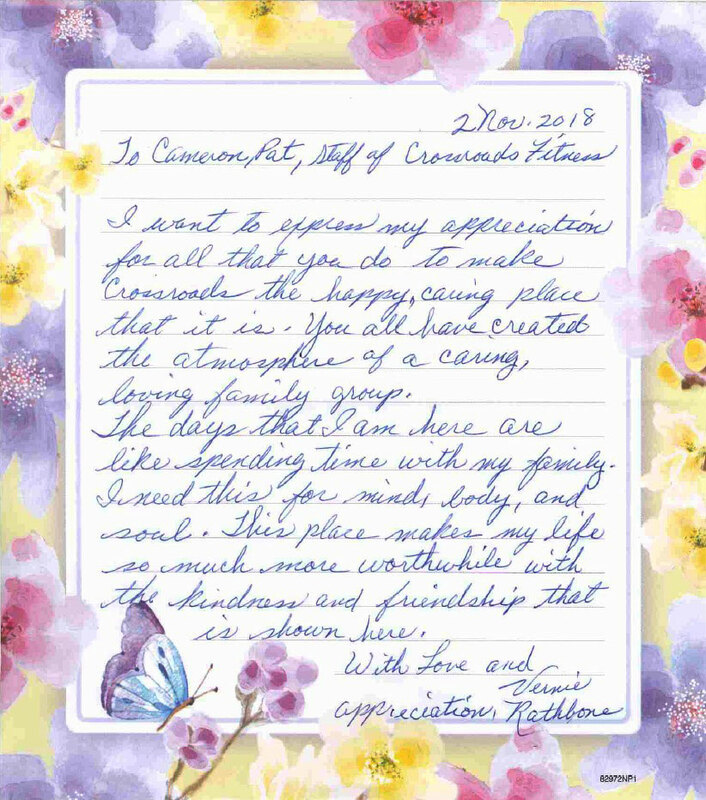 We send our heartfelt thanks to all the staff for helping us through a difficult time. During a health challenge, Crossroads staff was an intricate part of our lives. Many times, I would visit Crossroads for a workout, sometimes twice a day! Your exceptional staff was not only helpful, kind and supportive, but non-obtrusive. Crossroads became a second home. It was and is a place to maintain our physical strength and whole-health equilibrium. We are grateful for all your concern and we are looking forward to many years of enjoying the Crossroads Fitness Center family.